Colin Dalgleish currently serves as Managing Director of PerryGolf based in Scotland. He also has responsibility for seeking out and identifying unique and innovative golf travel opportunities to be enjoyed by its loyal and discerning client base. Colin began playing golf at 9 years of age and was a three time Scottish High School champion before going on to become Scottish Amateur Champion at age 20. He took up a golf scholarship at Ohio State University where he played alongside PGA Tour players John Cook and Joey Sindelar and was a member of their 1979 NCAA winning squad. He returned to Scotland where he graduated with a BA in Accounting from Stirling University prior to founding PerryGolf with his brother in 1984. His brother Gordon, who resides in Wilmington NC, serves as Company President of PerryGolf. Having played in the 1981 Walker Cup match at Cypress Point against a USA team which contained Hal Sutton & Corey Pavin, and subsequently captained the Scottish Team for four years, Colin was then appointed Captain of the Great Britain & Ireland Walker Cup Team for both the 2007 match at Royal County Down and the 2009 match at Merion. He is proud to now be a member of both these fine clubs, in addition to a few others. He captained an 18 year old Rory McIlroy in the 2007 match against a USA side which featured current PGA Tour stars Rickie Fowler, Dustin Johnson, Billy Horschel and Webb Simpson. Colin’s travels have taken him to almost every corner of the globe with golf of course playing a large part in this. He has played many of the world’s finest courses, and also some of its most remote and hard to reach venues. He particularly enjoys his travels with PerryGolf groups on our various golf voyages and our hosted tours to far flung lands. During his time in golf tourism he has served on the board of Golf Tourism Scotland, and in 2009 received the Lifetime Achievement Award from that body. While his competitive golf days may be behind him and his handicap increasing, like all golfers he holds out optimism for an improving game. He currently serves on the Equipment Standards Committee of the R&A. Beyond golf, he enjoys cycling, hillwalking and skiing. He has been a lifetime resident of Helensburgh, Scotland. PerryGolf is delighted to offer this very special 9 night, 4 round cruise to South America onboard the luxurious 690-seat Azamara Quest featuring golf in three countries. 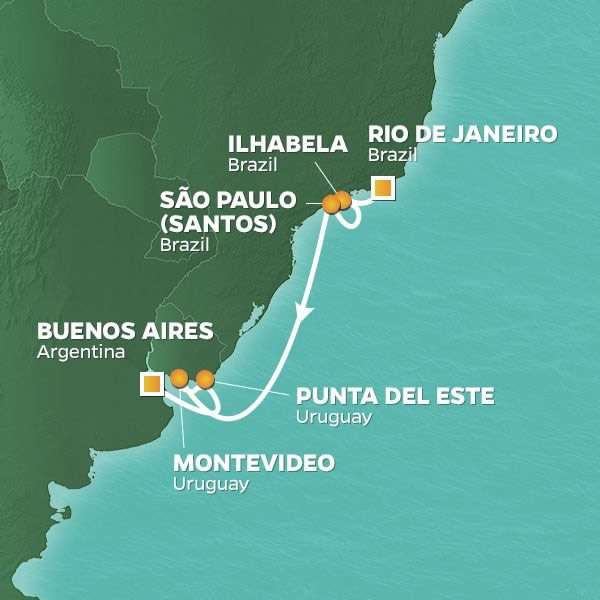 We begin in Rio de Janeiro and sail south, visiting San Paulo, Montevideo, Ilhabela and Punta del Este before reaching Buenos Aires. The golf is equally fantastic, highlighted by the Olympic Golf Course in Rio, site of golf’s 2016 return to the Olympic Games and highly rated Buenos Aires Golf Club ... Read More. Our golf on the cruise is diverse and challenging. Renowned architect Gil Hanse designed the Olympic Golf Course in Rio for the 2016 Games and the layout delivered a thrilling duel as Justin Rose outlasted Henrik Stenson to claim the gold medal. Buenos Aires Golf Club is ranked in the top two in Argentina and served as host for the 2000 World Cup of Golf Championship, won by Americans Tiger Woods and David Duval. Cantegril in Uruguay is a tree-lined layout measuring 6,411 yards from the tips that flourished after architect Emilio N. Serra’s redesigns in 1996 and 2000. Sao Paulo is rated #4 in Brazil and was designed by legendary Canadian architect Stanley Thomson assisted by a very young Robert Trent Jones. Azamara Quest is a mid-sized luxury vessel nimble enough to access smaller ports yet large enough to provide every amenity you expect from fine dining and live entertainment to a full-service spa. Forty-four suites are available with English butler style service which routinely book early. Particularly enjoyable about a PerryGolf / Azamara cruise is how the schedule will include many extended stays in port plus the occasional overnight which permits a truly immersive experience. Better still, Azamara Club Cruises are inclusive of a full selection of beer, spirits, soft drinks, bottled water, specialty coffees plus wine with lunch and dinner along with gratuities for housekeeping, dining and bar staff. The guest list will number between 40 and 60, most of whom are golf couples. It’s also common to have non-golfers who will enjoy themselves as a luxury cruise guest starting with Azamara Quest’s fabulous facilities combined with a wide selection of Azamara Shore Excursions®. The “2020 South American Golf Cruise” is a full-featured vacation and a unique opportunity to enjoy yourself in the company of like-minded new friends! Arrive Rio De Janeiro. Embark Azamara Quest from 1:00 PM until 4:30 PM. GOLF: The Olympic Golf Course is located in Barra da Tijuca slightly less than an hour from Rio. It was designed by the esteemed American architect Gil Hanse for golf’s return to the 2016 Olympic Games following a 112-year hiatus. The 7,160-yard par 71 layout served as the ideal venue for an epic battle between Englishman Justin Rose and the Swedish star Henrik Stenson, which Rose won with a brilliant 72-hole total of 16-under par. Inbee Park closed with a 66 to clear Silver Medalist Lydia Ko by five shots. SIGHTSEEING: Samba on down to Rio, famous for its dramatic landscape and beach culture, easy going except for the four days of frenetic, feather-festooned Carnaval. From the summits of Sugarloaf and Corcovado, take in glorious views of a magnificent bay set against a mountain backdrop. Check out the activity at one or two of the 23 beaches, crowded with sunbathers and swimmers, and also populated by surfers, bikers, and the girl from Ipanema. Pull up a chair at a churrascaria and dine on the delicious grilled meat of your choice, washed down with a caipirinha. No journey to Rio would be complete without a visit to one of the New Seven Wonders of the World —Christ the Redeemer (Cristo Redentor). At the top of Corcovado Mountain, towering high above the city below, this 125-foot-tall statue of Jesus Christ spreads its arms over Rio and offers spectacular panoramic views of Guanabara Bay. Enjoy Rio de Janeiro on your own or via Azamara Shore Excursions®. This beautiful island lives up to its name, and today belies its once lurid reputation as a hideout of smugglers and pirates. Where once failed coffee plantations replaced lush vegetation, the land has been reclaimed, and state park trails provide access to a luscious green jungle, with numerous waterfalls where you can stop for a swim along the way. Divers will find great opportunities on some of the many shipwrecks off the coast. And when you work up an appetite there is nothing better than shrimp right off the boat, accompanied by Brazil’s national cocktail, the Caipirinha, a delightful mix of capacha, lime and sugar. Enjoy Ilhabela on your own or via Azamara Shore Excursions®. GOLF: Sao Paulo Golf Club, rated #4 in Brazil, enjoys a rich history, its classic tree lined layout having been designed in the 1930’s by the legendary Canadian architect Stanley Thomson, assisted by a very young Robert Trent Jones. The Club’s earliest members were British Railway engineers. In 2000 it hosted the Brazil 500 Years Open to celebrate the discovery of Brazil by Pedro Alvares in 1500 . SIGHTSEEING: A nearly 500-year old city, São Paulo has grown to become Brazil’s largest metropolis, and is ranked among the most populous cities in the world. Vibrant and bursting at the seams with life, São Paulo is a dream destination for those who love an atmosphere where anything feels possible. Sampa, as the locals call it, is well known as a city that never sleeps. This round-the-clock lifestyle gives it a kinetic energy that is certain to captivate you, and with Azamara’s late stays in port, you’ll have ample opportunity to immerse yourself in every exciting moment. Start with a visit to the Museu de Arte de São Paulo—Sampa’s largest and most impressive museum, which contains the most comprehensive collection of Western art in all of Latin America. If you’re in the mood for shopping, visit the Shopping Iguatemi—a luxurious shopping mall where you can browse all of Brazil’s favorite brand names. If you prefer a more artisanal experience, head to the Feira da Republica. This open-air market is perfect for a stroll while checking out authentic local handicrafts and paintings. All this exploring is certain to work up your appetite, which is great news, because Sampa is regarded as a foodie paradise. With such a diverse population, the city’s food scene has grown to incorporate a world of flavors and cooking styles, so be sure to sample some seriously tasty street food as you explore the city. Enjoy São Paulo on your own or via Azamara Shore Excursions®. Enjoy another relaxing day at sea onboard Azamara Quest. Montevideo exudes European charm and elegance, with broad boulevards, fountains, stately squares, and irresistible sidewalk cafes. The city maintains a low-key atmosphere despite its position as Uruguay’s commercial and political hub, and there are few skyscrapers on the horizon, though there are some surprising contrasts – an Art Nouveau pedestrian mall, Art Deco Centenary Stadium, and an American Embassy designed by I.M. Pei. Most of the nation’s countryside is farm or ranchland, and the life of the cowboy, or gaucho, is part of the local lore. Take a peek at the Gaucho Museum (cowboy museum), or visit an estancia (ranch), and see them in action. Enjoy Montevideo on your own or via Azamara Shore Excursions®. GOLF: Cantegril Country Club is competitive for the accomplished golfer and playable for the recreational player. It has undergone several renovations through the decades, most recently in 2000 by Emilio Serra, an Argentine, who was the son of a noted professional. Recent improvements include drainage upgrades which enable the course to be maintained in excellent condition during the golf season. SIGHTSEEING: Fashionable Punta del Este is one of the most world’s most appealing seaside resorts, its white sand beaches popular with families and the glitterati alike. Fashionable cafes and shops line the streets, and an evening harbor-front stroll will no doubt include a serenade by street musicians and entertainers. The town projects an artsy vibe, with a contemporary museum and the Brava Beach open air sculpture park, displaying large works in steel, concrete, wood, iron, and marble. The fascinating Casa Pueblo, home of artist Carlos Paez Vilaros, is a dazzling white fantasy on a hillside overlooking the town. Enjoy Punta del Este on your own or via Azamara Shore Excursions®. GOLF: Buenos Aires Golf Club was designed by renowned architect Robert Van Hagge and built in 1994. It is ranked 79th of the "Best Outside US" and Top 2 in Argentina and guarantees a great golf experience. Water hazards abound. The club hosted the 2000 World Cup Golf Championship won by David Duval and Tiger Woods by three strokes over the home Argentine team of Ángel Cabrera and Eduardo Romero. SIGHTSEEING: Buenos Aires is a charming city with a strong influence from many of the main European cities. Beautiful walks, avenues, parks, monumental buildings, cafes, museums and churches gathered in 26 districts, each with its own distinct personality, creates a truly cosmopolitan air. The northern quarter resembles the most elegant areas of Paris; The abundance of cafes on May Avenue evokes the flavor of Madrid's Gran Via; the shady Belgrano streets recall the distinguished Londoners suburb; Naples seems to be present in the noisy and colored La Boca quarter. Enjoy Buenos Aires on your own or via Azamara Shore Excursions®. Disembark Azamara Quest at 9:00AM. The Olympic Golf Course is located in Barra da Tijuca slightly less than an hour from Rio. It was designed by the esteemed American architect Gil Hanse for golf’s return to the 2016 Olympic Games following a 112-year hiatus. The 7,160-yard par 71 layout served as the ideal venue for an epic battle between Englishman Justin Rose and the Swedish star Henrik Stenson, which Rose won with a brilliant 72-hole total of 16-under par. Inbee Park closed with a 66 to clear Silver Medalist Lydia Ko by five shots. Sao Paulo Golf Club rated #4 in Brazil, enjoys a rich history, its classic tree lined layout having been designed in the 1930’s by the legendary Canadian architect Stanley Thomson, assisted by a very young Robert Trent Jones. The Club’s earliest members were British Railway engineers. In 2000 it hosted the Brazil 500 Years Open to celebrate the discovery of Brazil by Pedro Alvares in 1500. Cantegril Country Club is competitive for the accomplished golfer and playable for the recreational player. It has undergone several renovations through the decades, most recently in the 1990s by Emilio Serra, an Argentine, who was the son of a noted professional. Recent improvements include drainage upgrades which enable the course to be maintained in excellent condition during the golf season. Buenos Aires Golf Club was designed by renowned architect Robert Van Hagge and built in 1994. It is ranked 79th of the "Best Outside US" and top 2 in Argentina, and guarantees a great golf experience. Water hazards abound. The club hosted the 2000 World Golf Championship won by David Duval and Tiger Woods by three strokes over the home Argentine team of Ángel Cabrera and Eduardo Romero. Sao Paulo Golf Club, rated #4 in Brazil, enjoys a rich history, its classic tree lined layout having been designed in the 1930’s by the legendary Canadian architect Stanley Thomson, assisted by a very young Robert Trent Jones. The Club’s earliest members were British Railway engineers. In 2000 it hosted the Brazil 500 Years Open to celebrate the discovery of Brazil by Pedro Alvares in 1500. Buenos Aires Golf Club was designed by renowned architect Robert Van Hagge and built in 1994. It is ranked 79th of the 'Best Outside US' and top 2 in Argentina, and guarantees a great golf experience. Water hazards abound. The club hosted the 2000 World Golf Championship won by David Duval and Tiger Woods by three strokes over the home Argentine team of Ángel Cabrera and Eduardo Romero.